Perfect pack for your Video Game Fan's bathroom. Decorate your bath with these fun dance themed silhouettes and bright colors. Each Wall Print is 8x10in - Frames not included. Remember to FLOSS - Keep It FRESH, Take a Shower - TIDY Up After Yourself - Don't earn a FACE PALM, Flush the Toilet! High quality graphics and material - Fun Theme - USA Made. 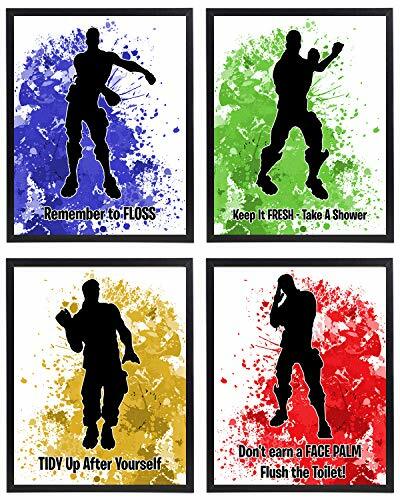 Remember to FLOSS - Keep It FRESH, Take a Shower - TIDY Up After Yourself - Don't earn a FACE PALM, Flush the Toilet!